We deliberately cut this rock crystal cabochon to show off its beautiful, icicle-like imperfections (inclusions) - they are what make it interesting & also unique. A truly fascinating stone, ancient Japanese believed rock crystal formed from the breath of a white dragon. Australian Aborigines used it in rain rituals. Crystal balls have been used to predict the future at least since the Middle Ages. 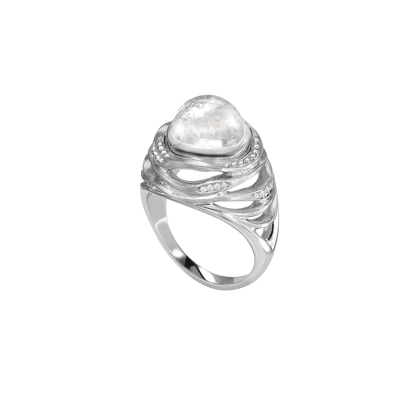 Throughout the ages rock crystal has captivated imagination and is widely believed to have tremendous powers. Handmade with a great deal of love & expertise in Hatton Garden, & hallmarked by the London Assay Office.